Approximately 75 members of 16 F.A.I.T.H. Riders chapters across Oklahoma are taking the Gospel to the 70th Annual Sturgis (S.D.) Motorcycle Rally, Aug. 9-15, according to Keith Burkhart, family and men’s ministry specialist with the Baptist General Convention of Oklahoma. Meanwhile, Don Hunter has less than a handful of chaplains on his team as he prepares to lead a ministry to what is an expected crowd of nearly 700,000 bikers, et al, who will attend the rally and associated events in the Black Hills. Hunter said the chaplains’ responsibilities have been expanded this year in that they are working even closer with local area law enforcement and first responder agencies. “We have more responsibilities this year,” Hunter said. “In the past, we have helped with domestic incidents and debriefings and so forth; this year, they’re turning all of the crisis intervention and crisis management over to us entirely and making us officially part of the city team. We will help with all aspects of crisis—suicide intervention, critical incident debriefings, and so on. In addition to Hunter, chaplains Brad French from Woodward and John Dries from Bethany will be joined by another chaplain from South Dakota in the ministry, which also includes working with vendors and the street ministry. Hunter’s group will be headquartered at Sturgis, First, while the F.A.I.T.H. Riders are staying at Rapid City, S.D., Calvary, Burkhart said. The F.A.I.T.H. Riders will be mainly working the evangelism tents set up across the street from the Sturgis Motorcycle Museum and Hall of Fame and at the Harley-Davidson dealership in Rapid City, a new site this year. Also, a third evangelism tent is being set up in Custer, S.D. near the Crazy Horse memorial, not far from probably the state’s most popular and well-known attraction, Mount Rushmore. Burkhart said an additional 45 or so F.A.I.T.H. Riders from Alabama, Florida and Georiga also are expected to attend the rally. The evangelism strategy at Sturgis includes an opportunity to win a new Harley-Davidson motorcycle for anyone willing to listen to a three-minute testimony. Burkhart said the Oklahoma F.A.I.T.H. Riders have been sharing the Gospel on Fridays during youth weeks at Falls Creek this summer as a warm up for their trip to Sturgis. “It has been a double blessing. They had about 400 witnessing contacts at Falls Creek last week, and 20 campers accepted Christ as a result of their efforts,” he said. The first Sturgis Rally, known as the Black Hills Classic, was held on Aug. 14, 1938 with a race of nine participants and a small audience. Because of gas rationings in support of the war efforts, the Rally did not take place in 1942. 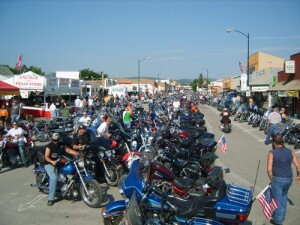 The Sturgis Rally saw its largest attendance exceeding as high as 600,000 people in 2000.